When we think of dementia, we typically focus on memory loss, difficulty finding the right word, disorientation or poor decision-making skills. These cognitive aspects are central to Alzheimer's and other kinds of dementia. 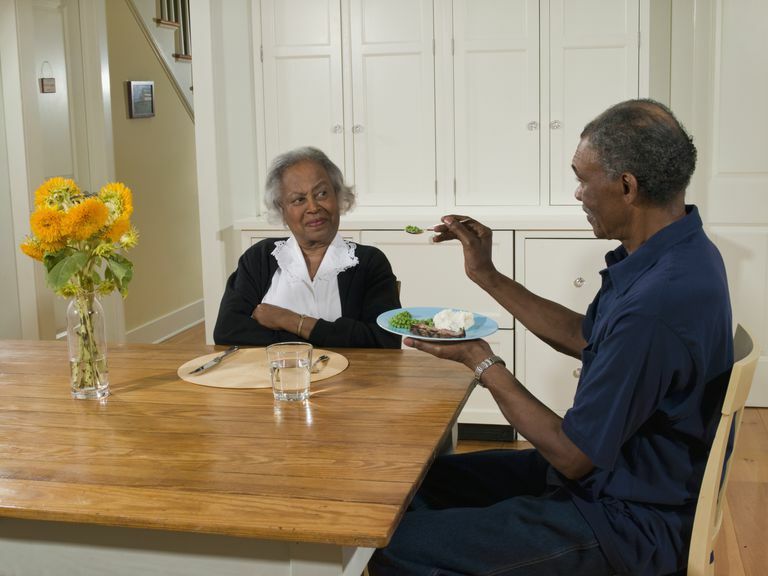 However, other challenges in caring for the person with dementia include those related to activities of daily functioning, such as eating, drinking, bathing, and dressing. This includes difficulties in eating and appetite changes, which often result in unintended weight loss. According to a study of more than 16,000 adults published in Alzheimer's & Dementia: a Journal of the Alzheimer's Association, unplanned weight loss is strongly correlated with dementia severity. Modeling eating- Show her how to use the spoon for the cereal. Sit down and eat with her. Quieter environment- Sometimes, there are too many distractions to concentrate on eating a full meal. Smaller portions on the plate- Try offering a less-full plate of food so that it is less overwhelming. Cook aromatic food- Ask the person with dementia to assist you in cooking or even just be near you so that the aroma can whet her appetite. Simplified directions- Give clear, simple directions, one at a time. "Here's the spoon. Put potatoes on the spoon. Put the spoon in your mouth." Finger foods- Foods that don't require utensils can ease the challenge of getting food to the mouth. More frequent, smaller meals and snacks- Less food at a time can encourage eating. Visit the dentist- Evaluate the condition of teeth and dentures. Ask the dietitian- If he's on a heart-healthy diet, can his diet order be loosened to allow for a few treats now and then? See the eye doctor- Are vision changes making it harder for him to eat? Ask the doctor- She can consider if any medications could be causing appetite loss. Occupational therapy- An OT can offer individualized strategies for eating, including adaptive equipment. Hydration- Encourage adequate and tasty fluids. Don't be a stickler about dessert- Sometimes, dessert first is not a bad strategy.